Welcome to the last installment of this year's "July-lights". We have seen jaw dropping dangles, bone crushing hits, and unbeleivable saves over the past month, but like all great things it must come to an end. Which brings us to the the final highlight of the month, the goal of the year. Along with his fellow rookie teammate, Taylor Hall, Jordan Eberle is among a developing young cast of future stars on the Edmonton Oilers' roster. It is a feeling universally felt around the league that as these young stars continue to get older and develop, both them and the OIlers will get better and grow into a Stanley Cup contender. Eberle specifically is coming out of his rookie season, where he scored 18 goals and notched 25 assists totaling 43 points in just 63 games played. A formidable rookie season that would have gotten more attention had fellow rookies Jeff Skinner, last year's rookie of the year, and Logan Couture not produced 50+ point seasons. However, most rookies can't say they scored their first NHL goal shorthanded and in highlight fashion (see below). For most rookies their first NHL game would be a nerve rattling experience, and they would be happy with a good amount of ice time and a shot or two on net. Not Eberle. 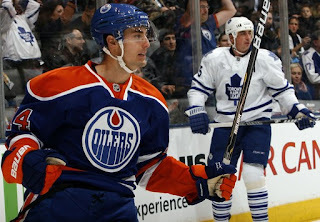 After he received a breakout pass, Eberle skated through the neutral zone and came down on a two on one. After the defense man committed and dropped to his stomach, trying to cover the pass, Eberle went to work. A toe drag around both the Flames' d-man and goalie, plus finishing the goal off with a fall into the corner, and his first ever fist pump celly. Add all that together and we have the combination for this year's best goal and number one highlight of "July-lights". Until next year.